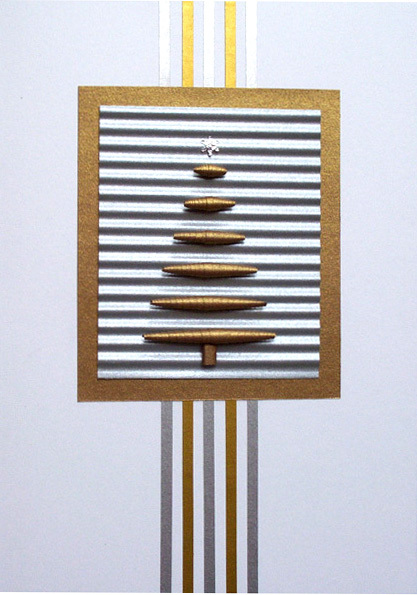 Here's a really simple, but unique Christmas card idea - paper beads form the shape of a stylized tree. I'm a fan of cards with a minimalistic look, especially if there's a bit of shine to take away from the starkness. This one is metallic silver and gold on white, but it would also be pretty in silver and navy or perhaps sage green and light blue... or any of a zillion other combinations, whatever you happen to like. 2. Glue 2 gold and 3 silver strips lengthwise down the center of the card. Start by marking the 2 1/2 inch center point at top and bottom of card; glue silver strip in place using marks as a guide. Space remaining strips 1/8 inch apart, alternating colors. 3. Cut a 3 inch x 3 1/2 inch rectangle of gold paper; center and glue in place as shown, about 1 1/2 inches from top of card. 4. Cut a 2 inch x 3 1/2 inch rectangle of silver paper. Crimp and glue to center of gold rectangle; press gently in place without compressing crimps. If the paper crimps unevenly at first, continue running the same rectangle through the crimper until you get straight, horizontal lines; sometimes it takes a few tries. The same piece of paper can be re-crimped over and over without harm. 5. Draw and cut out six pennant-shaped triangles of gold paper in graduated sizes. They should measure 1 1/2", 1 1/4", 1", 3/4", 1/2", and 3/8" at the widest end of triangle; sides measure 3 inches in length. Use paper trimmer or scissors to cut them. 6. Roll each bead on the wire rod; start with wide end of triangle and use firm, even pressure while rolling. Glue tip of triangle at center point. Slide bead off wire. 7. Glue beads between silver paper crimps, referring to picture for placement. For gluing ease, spread a thin layer of glue on a plastic lid. Use tweezers to hold bead and touch it to the glue. Place bead directly on the card, nestling it between crimps. 8. Punch and glue star (I used a small snowflake) as tree topper. 9. Cut a 1 inch x 1/4 inch piece of gold paper; roll on wire rod. Allow it to relax slightly and slide it off wire. Glue end and flatten the roll gently. Glue vertically below tree as a trunk. Just think, if you make some cards now, you'll be that much ahead of the game come the truly frenzied, creative time in December! Ann hi! Just "happened" to find your blog somehow and this is my first post. Just love your innovative touch to this design and it's a great tutorial. thanks for this really great idea and so simple but so effective.